Here is a “before” and an “after” set of photos. Notice how the “before” image appears washed out and with a distinctive green tint. What magenta (red) there is in the photo is concentrated in the middle; the edges are even more green. The “after” image looks, well, wonderful. My HP Color LaserJet 2605dn printer is about 16 months old. A few months ago, I noticed that the pictures it printed started looking washed out. I tried changing the magenta cartridge, for all photos seemed to have a green cast. That did absolutely nothing. I figured as much, as the “HP Easy Printer Care” program, and the printer’s internal web pages, said there were several hundred pages left to go on all my cartridges. Updating the firmware also failed to fix the problem. Resetting the printer to its default settings also accomplished little. I tried recalibrating the printer (see step 24, below) to no avail. NOTE: try this first yourself just in case it is the problem with your printer – will save you all the trouble in steps 1 to 23! Thankfully, an Internet search turned up an article on FixYa that described the problem exactly. A Google search on “2605 faded colors” also shows articles about it at HP’s website (you’ll have to look at the cached versions of the pages as it seems you need to log in to HP in order to see the actual articles). 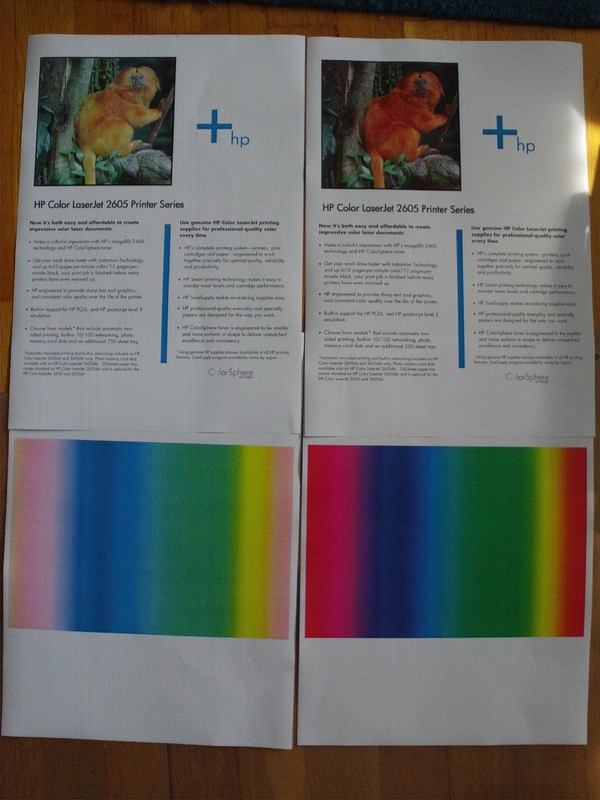 Don Thompson wrote a wonderful article on fixing this issue which he put on the HP support forum; I have obtained his permission to include it here in this article – its what I followed all those years ago to fix my printer for the first time. An example of how an image is "written" onto the photoreceptive drum in a laser printer. Be very observant of where things are before taking them out. to refer to them when putting the printer back together to make sure everything was as it should be. You undertake all this at your own risk. I started at 15h30 and got to the optical box at 17h16 — just under two hours; but I was taking photos along the way. Reassembly started right after cleaning at 17h30 and finished about an hour later (I took a break for dinner and putting my kids in the bath and to bed), so this is approximate. Ask your wife/husband/partner to make you a lovely cup of tea. Please ensure you have tried the other things listed above first! Perhaps a quick clean of the plastic reflectorsbehind each toner cartridge is all you need. Unplug printer from the mains and detach your USB or Ethernet cable; take out the paper tray and all the cartridges (this makes the printer lighter and easier to handle). Turn the printer around to look at its back. Remove the paper tray cover at the bottom and the paper holder tray at the top. Both just pull off. Undo the screws on the back panel, including the one just below the USB and Ethernet ports. Put these screws into their own pile (later you will have another pile for all the screws you take out of the inner panel. Its a handy trick to help you ensure you put back all the screws you take out. Take a photo of the circuit board and wiring — you’ll want to refer to it when putting things back together, just to be sure you have done it all correctly! Start taking off the cover of the left-hand side by first undoing the screw that is recessed in the handle/indentation at the bottom of the left-hand side’s panel. Then, pull the beige panel piece off, leaving the larger, grey panel piece for now. Okay, now take off that grey panel piece by tilting it up and sliding it off (it has the same mechanism as the other side). Gawk again at the wonders of your printer. This is the high-voltage side. If you didn’t unplug your printer as I told you to, then you will be now convulsing on the floor and sporting a new hairdo. Squint when really close to the circuit board on the back of your printer and you will see that each cable goes into a connector that is labelled something like “J106”. You will soon be taking these cables out and later you will want to put them back in – at the same place! So, print out labels which you can attach to the cables. My label maker let me print out super-small letters and on two lines. You want small labels because the connectors are not that big. Here’s what I printed out (the ? or Enter or Return key is used to tell the label maker to go to the next line): J106 J104 J103 J102 J101? J108 J107 J105 J110 (My label maker wouldn’t let me print out any more than that in one go; so, being lazy, I didn’t bother labeling the very last cable connector). Then, use scissors to cut each connector name out. Now, pull each cable connector out, one at at time, and put the correct label onto it. Note that the purple cables are attached to a plastic block (some black, some white) which is pushed into a plastic holder, like a small box – think of a baseball with purple strings sitting snugly in a glove. Pull firmly on the purple cables (perhaps wiggling slightly side to side) near to where they go into the plastic block, this should remove the block from its plastic holder. Do not use tools, for fear of pulling out individual cables, or worse, pulling off the outter plastic box, instead of the block in which the purple cables are (as Piper, in the comments below, did). Carefully detach the data cables, too, and unthread them from the plastic holder (you will soon be taking off the plastic holders). The data cables to the circuit board on the right side of the back panel also pull out quite easily and reveal a hidden screw! I didn’t bother labelling these as the data cables all stayed in the right order when disconnected. Pull the empty trays to the side to unfasten them and then take them out completely – be sure no stray wire gets snagged by them! Unscrew the back panel – no need to undo the two circuit boards themselves – they are both attached to a larger metal panel. Note that there is one screw that is in horizontally on the top-left (this is why you took off the side panel!). Note that your printer may not have the extra memory card inserted as I have in mine (see picture). Pull out the back panel with the two circuit boards on it. Be sure that no cable is snagged, or left attached. Okay, you found the two screws holding the optical box at the top; but where is the third screw that I mentioned? Tip: tip the printer so you look at the bottom of it, where the paper tray usually goes. See them? Two shinny plates. They bend when you pinch them with your fingers. Now, on my printer there was a screw beneath just one of them. Feel lucky? Which one will you take off? Were you lucky? Or maybe your printer has a screw underneath both… The screw holds the bottom part of the optical box. Take out the third (and maybe forth) screw. Gently lift up the optical box and remove the pair of data cables that go to it. Again, I didn’t bother labeling these as they stayed in the same position/order and wouldn’t get muddled up when I reassembled everything. At last! There are the filthy mirrors that are the cause of this nightmare. If only HP has seen fit to seal this optical box then none of this would have been necessary… Okay, that wasn’t really a step, it was just some soap-boxing. Here is the real step 20: Clean the mirrors using dry cotton swabs! Gawk at the wizardry of the optical box, its lasers and your nice shiny mirrors. Play with the flaps that cover the laser openings — don’t loose that spring which is between the flap mechanism that covers the laser diodes and the optical box. Underside of the printer; note the black grill on top left - that's the air intake for the fan. (optional) On the first anniversary of this page, and my second go at cleaning the mirrors (yup, they got dirty enough in the one year to warrant going through this lot all again), I decided to slap on a homemade air filter to the fan intake. Make sure you don’t have the paper tray installed; and then tip the machine onto its front, so that you are looking at the underside of it. You’ll see a black grill or grate. Vaccuum cleaner bag cut to fit over the grill, so it acts as an air filter. Get yourself a vacuum cleaner bag and cut it to fit over that grate. Use some cellotape to stick it in place. You may very well have to do as I did and cut little slits in the bag so it fits over the silly extruding bits of plastic. If I haven’t already said it, I’ll say it now: this printer is over engineered! Now tip the printer back to its normal position and install the paper tray. Alternatively, you can use the printer’s built-in web server over the Ethernet port to force an immediate recalibration (sorry, don’t know what you do via USB). (optional) Unconnected Connectors and An Interesting Button… While you had the covers off and the circuit boards exposed, did you notice that there are a few unconnected connectors and a “test” button? One connector is “IOT” and the other is “MCPU Writer”. After I reassembled and plugged everything in, I pressed the “test” button. I got a boring printout of colour lines. Please leave a comment below to say if this page helped you; or, if any steps were unclear. Happy colour printing! I’ve been debating on trying this for months and finally decided to take the plunge today and give it a shot. I started around 9AM and just printed my “let’s hope this worked” page. It turned out beautifully! Thanks so much for the thorough tutorial! Worked just as advertised! Thanks for the great instructions! I’ve used Andrew’s wonderful instructions twice to correct the color on my HP 2605dn. Unfortunately I used somebody else’s instructions another time, and because no repair facility in Southern California would touch such an old printer, I had to send it to Wisconsin. UPS destroyed that printer, and refuses to make restitution. The moral of the story is use Andrew’s instructions, label the connectors as instructed, buy Andrew a beer, and then it is just a matter of getting the alignment just right when you put the black box back in. Knowing that might be required is the hard part. Looks like a well documented proceedure — I’ve worked as a site support engineer, so I’ve dissasembled and reassembled a few things in my time. Made the mistake of buying a cheap re-fill cartridge — can you say “dust injection?” The only thing that I may do differently is that I’ve always used 100% iso-propyl alcohol as a cleaning ajent when working on printers. But thanks for the detailed job. Thanks from the Netherlands !!!!! TODO A LA PRIMERA Y FUNCIONA!!!!!!!. BUENA EXPLICACION. This is the second time I’ve followed this procedure, so thank you for keeping this posted. This time, I also had toner running low, so when I was done I was getting the gray haze / fuzz / blotchiness all over each page. I replaced the remaining toner (black, yellow, and cyan) and it appears the third party black toner is pretty weak. The monkey demo has lost some contrast and the cleaning page is very light too, but the TEST bars look great. Great write up and instructions. Mine is working like new now. Had the faded red, bottom mirror had lots of dust on it, so bad I had to gently use a cotton swab with a tiny bit of rubbing alcohol on it. I was careful to only use this on the glass lens and not the plastic one. First time back together and no print, no color, etc. it spit out paper but no ink. Took it back apart and found the lens box not properly seated, close, but not right. Re-installed and just snugged down the three screws, re-assembled and all is great. Also noticed that all of the connectors are a different count, so no need to worry about putting the wrong one in, just patience and care. Yes – I have. After fixing my machine in December 2012 I put a sheet of clear Melinex film behind the cassettes and in front of the laser windows and there’s no sign of any adverse impact on the print quality. I tried it first with cling-film and even that hardly affected printing despite having a few wrinkles in it. The Melinex is stiff enough to just stand there flush against the metal surface without needing any fixing. I can’t tell if it really is stopping toner from entering the laser box, but it’s not doing any harm so I’ll just wait and see. It’s been there two years and printing is still ‘like new’. I’ve used Andrew’s excellent instructions to restore two of these machines to like-new performance. One I bought new in 2007 and the other a friend gave me after he got fed up with it and replaced it with an Oki laser printer. Hi, I had the same problem the first time I dissambled the printer, it just printed blank pages, I had to dissasembled it again, check the conexion and put together again, and presto! the machine worked again! Thank you very much! Worked percfect! My problem is that although my color is back, and everything else looks great, there is an almost iridescent green “smear” that feathers out starting about .6 inches in from the right edge, and becomes solid by the time it gets to 1/8″ from the edge of the paper. This “smear” is over the image, which still appears with some color beneath it. It does not appear when printing plain black text, but when that text runs to the maximum width of the page (MS Word lets me actually have the letters run off the page, but the printer has a limit of about 1/8″), the text fades unevenly on the right, although not as far in as the green smear would go. I’m suspecting a slight misalignment of the optical box. I know I put the one bottom screw back in its place to hold the box. There was not a 2nd screw in the right-hand hole. Maybe I should play with that. Andrew, I’ve followed your instructions once before, and the results were amazing. And yes, I bought you a beer 🙂 This time I was using an HP 2605dn that I got from a dealer in off-lease printers. It seems they do repair work, but the man in charge didn’t even know about dusty mirrors. So for all I know, this present printer was already halfway there (as in needing the mirrors cleaned) when I got it. The color did finally go, and I followed your instructions. I find that the flat mirrors, not the curved ones, are what gets dirty. I also realized, having done vacuum deposition coating in my youth, that those glass mirrors had to have an over-coat of SiO2 (quartz). Using a Q-tip (aka cotton swab), it is impossible to scratch the coating. So the color came back, but now I find something I can’t understand. When I run a plain text page through the printer, everything looks great, but when I print out a dense color print through, that extends almost to the maximum printable margin, there is a smear of light green over the detail, which is still there. I’ve tried several Calibration cycles, and cleaned the transfer belt. The Calibrations seem to have moved the smear off the side a bit, but mostly it’s still there. Could I have not seated the optical box correctly? The smear is only on the right side, and only about .75cm in width. Yesterday I took my printer apart and cleaned the mirrors like the tutorial says. Now my reds are perfect, but the right side of my paper about 1″ in from the edge is faded out to the right so that you see nothing past 1/2″. The left side prints perfect, is this what your problem is? My problem is that although my color is back, and everything else looks great, there is an almost iridescent green “smear” that feathers out starting about .6 inches in from the right edge, and becomes solid by the time it gets to 1/8? from the edge of the paper. This “smear” is over the image, which still appears with some color beneath it. It does not appear when printing plain black text, but when that text runs to the maximum width of the page (MS Word lets me actually have the letters run off the page, but the printer has a limit of about 1/8? ), the text fades unevenly on the right, although not as far in as the green smear would go. I’m suspecting a slight misalignment of the optical box. I know I put the one bottom screw back in its place to hold the box. There was not a 2nd screw in the right-hand hole. Maybe I should play with that. Okay, I found my answer. When you replace the optical box in the printer, as Andrew noted, you have to be delicate. Don’t tighten the three screws (or four) too much. Just snug. I’m sure there are only two or three threads in the metal frame of the printer to accept those screws. It could be one of these screw’s threads got worn a bit, and didn’t give me a good solid feel when it was tight. Also make sure you are using the three (3) LONG screws, which have separate lock and flat washers captured on them (the rest of the screws are one piece including the washer). The optical box should hang from the top slot evenly. Again, make sure you put the bottom screw (in the hole with the thin metal cover) in the same spot you took it out. I thought maybe I had stripped out the threads in the left bottom hole, and so put the screw in the right hole. I ran the test that is initiated with that TEST button Andrew pointed out. The lines only reached a couple inches across the page, the yellow being longest. And a test image printed with the right side of the page yellow, and the red very concentrated on the left. Even the black text was all over the place. Obviously there was a reason they only used one screw on the bottom. That’s when I switched the bottom screw (possibly a bit stripped) with one of the top screws. (NOTE: If you have two screws on the bottom, one may be even longer than the other. The hole in the optical box casting is deeper on the right side). I buttoned up the printer, ran the TEST, and the lines all went the whole width of the page. Feeling I’d licked it, I ran my most critical page, and the colors were all out of alignment. Ran a Calibration, and now things are perfect again. My green smear is no more. So christin I’d say you may have the optical box a bit out of alignment. I am thinking that Calibration can only do so much, will do wonders if you get things close. I’m buying you another beer, Andrew. I had the problem that it did not print on the right side after cleanng. I could not face stripping it all out again so I tried just removing the back panel. Then I could see the top two screws in the optical box. I slackened these slightly and then gently levered the box from side to side with a large screwdriver. Now it prints across the full page. Both yellow and red mirrors were dusty. Now it prints like normal after cleaning. Thank you!!! Excellent post. I too had the color fading problem. With your excellent post, I had the confidence to proceed. Your instructions and pictures were very clear. 2 hours of dis-assembly/assembly + a couple of re-calibrations and my 2605dn prints like new. Wow! But I will comment, that whatever engineering team designed this printer clearly made no accommodations for future service. After this repair, replacing the fuser (or anything else, for that matter) will be very easy by comparison. Thank you! Thank you! Thank you! Just cleaned mine, took about 2 hours (first time). My printer is now printing like new. Thanks again! Thanks to you’re perfect description i just manages to disasemble and clean my HP color lasterjet 1600 in just 1½ hours and it is now as good as new!! Thank you very much! Worked like a charm! The 2605dn is printing reds again and my kids have no more excuses on why they aren’t finishing their homework. Thanks mate, enjoy your beer! Anyway, just did it all a second time – getting easier – only took a leisurely hour. Red is back. Hello Andrew after I followed your instruction, which was very helpful, and I recalibrated the printer it printed only very fading hardly visible test page. Do you have any suggestion what went wrong? Thank you so much for this! I just got an used printer and thought my money was wasted when it printed faded pictures, but thanks to your guide I was able to fix it myself! Your guide was extremely helpfull! worked out great! thanks a lot! I agree, but a piece of (optically near perfect) material taped over the horizontal slots could be easily cleaned, just by removing the cartridges! Any ideas? What about cling-foil, or those stiff transparent plastic sheets often used as the front covers of bound documents? PS Is there any reason for NOT taping something over the slots? E.g. Could it interfere with the paper path, or get very hot and catch fire, …? Those horizontal slots are part of the light-path and thus critical to the performance of the thing. Any cover would need to be optically near perfect. However, if you did this, the dust would collect there and similarly affect the performance. What is really needed is to blow clean air into the light-box so a slight positive pressure is maintained inside and air-flow is outward through all the slots and other openings. That way no dust could get inside. How to do this – well, there’s the rub! Have you any suggestions as to how to avoid dust getting into the laser/scanner assembly? (I’ve added an air filter but that doesn’t seem to help much.) Has anyone tried taping cling-film, or some other transparent material, over the four horizontal slots behind the cartridges? My problem with the HP Color LaserJet 2600n seemed to be the reverse of this — most of my pages were being printed with a reddish tint through the middle. At first, I thought some of the toner was running out, but then I noticed that the outside edges looked fine, and toner wouldn’t be that discriminating. So I went through this process….and now I have more reddish tint than before, as it extends more to the left of the page. I just finished putting it back together again, and recalibrated. When printing in grayscale it looks great, but when I print in color, I get just about a full page of cyan. I rechecked all cables and pins, but can’t find out what’s the cause. RE: Will not print anything. OK guys, I know you are frustrated right now. After just finishing mine up for the third time, I have gotten pretty good at this. There are four things I would check. First, check all of the plugs on the small circuit board The one on the back right as you look at the printer from the back). Take them out, and make sure no pins are bent (if so, straighten them with a small pointed knife. Second, the ribbon connectors can be difficult plug in (However, they need to be all of the way in and seated firmly), and they may not be in facing the right way (metal to metal), and or may need cleaning. Take an eraser and lightly rub the silver contacts to remove carbon, and if the ends are bent, straighten them before you plug them in. Oh, and especially pay particular attention that the cables are plugged into the black box you removed and cleaned. Three, There is a ribbon cable at the top of the main circuit board and several connectors, (this is the Big board on the left side of the printer) check those to make certain that they are connected and seated properly. Lastly, check the thin purple wires that you had to move, and make certain that one did not break away from the connection. Those wires are thin and easily damaged. I did everything as shown but now it’s not printing at all! Not even a tiny smear nothing :/ what should I do now? Anyone with the same problem? I have a HP Color LaserJet CM1017 MFP. I had a lot of yellow when I printed. Now it’s resolved. Thx a lot !!!! Amazing! I picked up a 2600n at the thrift shop for $8 because it wasn’t printing red…2 hours and this webpage later everything is working perfect and when I double checked, the magenta cartridge was 100% FULL! Thanks for the great writeup! any chance you would know why mine is not printing anything at all now? no errors just all the pages come out blank. not even a spot on the page. That just happened to me too 🙁 did you find any solution? I had the same problem: not printing anything at all after laser box cleaning. I’ve seen a youtube video warning about the importance of not touching the 2 rotating squares between the mirrows (https://www.youtube.com/watch?v=R1DIko0a1MA, 20:45″). I’ve to check that in my printer, but have to disassemble it again. I’ve dissassembled my printer yestterday and realized that both rotating polygonal mirrors where dissaligned. I rotate them manually following the above video indications, reassembled again the printer and … it works!!!! Thank you, thank you, thank you. Your diagnosis and excellent instructions were dead-on accurate. Fixing this made me the hero of the day, but the kudos go to you. Thank you so much…we did everything you said and now it works like brand new!! The monkey from the demo page looks alive!! Thank you for this. It was exactly what we needed fixed. Your steps are very detailed and accurate. It took me two hours, taking my time to label the connectors and get wiring in the cable tray clean. Thanks! Thanks a lot. Took about an hour getting it apart. I got the optic box open and was dissapointed as everything already looked very clean. Swabbed everything and the swabs were barely showing any dirt. Then I got out an LED flashlight and the red mirrors showed a definite film in places and could see it clean away as I swabbed. So there was dirt there I couldn’t see with my normal desk lighting. I tried red and blue LED lights as well – the red light showed a bit that the white light hadn’t. Swabs still look clean but actually seeing the dirt go away made me feal better. sorry I cannot get past step 13 pulling out the black plastic trays that hold all the wires. I got the small on on the left out but the top and right side (from the back) don’t want to release. I am sure there is a trick but I can’t get it. Thanks! I will happily donate to your site if this works!! Re: removing the black plastic trays. I got stuck at this same step (Step 13) and was about to give up when I figured it out. Step 13 says to pull the black plastic trays to the side. On my printer that applied to the long black plastic tray across the top of the back panel – if you slip it left it pops out. BUT, FIRST I had to take out the black plastic tray on the right side (when facing the back), and that had a totally different removal process: two little whatchamacallits (locking tabs??) that you had to depress before it popped straight out. One whatchamacallit was on the bottom side, the other one on top of the bottom section that extends to the left. Two other things: my left side panel (when facing the front) didn’t come off in two separate pieces; the beige and grey pieces were connected and I had to take them both off at once. Furthermore, in order to take it off I had to have the front panel open (the one that swings down for toner cartridge access), since part of the left panel slides underneath the front panel. Other than that, and the fact that I screwed up the alignment by rotating my squares in the optical box and had to redo the whole thing all over again, this process worked perfectly, and I’m sooooo grateful! Thanks Andrew, beer coming your way! Hello Andrew. Just a quick note to let you know you saved me a printer replacement and I am deeply grateful! Thank-you Reeves-Hall household out-of Austria! Thank you Reeves-Hall family from Sweden! Update. Did mine this morning, took about 90 leisurely minutes. I was actually surprise – the magenta mirror was dirty, but not that dirty. It doesn’t seem to take much. Thanks again for the “help”, its always nice to have a guide the first time.